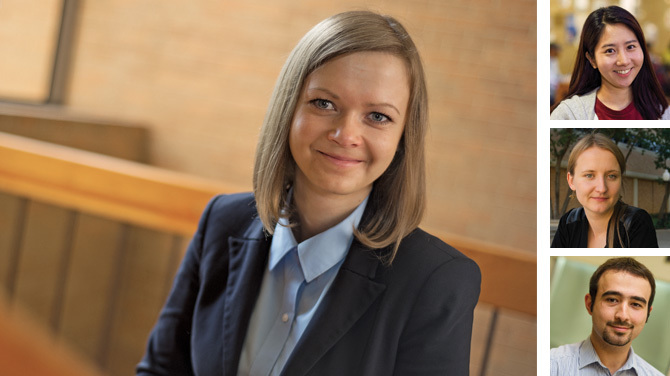 Ulyana Zavadskaya is one of four international Fulbright Scholars on campus this year. Also pictured, from top, Jiyea Kim of Korea, Kaija-Luisa Kurik of Estonia, and Jeyar Alsofi of Iraq. Ulyana Zavadskaya always wanted to study abroad. So in 2012 after graduating from Belarus State Economic University in Minsk with an international marketing degree, she started applying to American universities. She targeted UT Arlington and gained admission to the Master of Science in Marketing Research program, but she needed financial help. That came when she received a prestigious Fulbright Scholarship, enabling her to enroll last fall. The Fulbright is the flagship international exchange program administered by the U.S. government to increase mutual understanding between America and residents of other countries. “UTA’s program turned out to be my perfect match in terms of curriculum, internships, and the assistance that is provided to students to establish a wide network of professional contacts,” she says. Zavadskaya is one of four Fulbright scholars—the most ever in one academic year—enrolled at UT Arlington for 2014-15. The others are Jiyea Kim of Korea, a linguistics Ph.D. student; Kaija-Luisa Kurik of Estonia, a doctoral candidate in the School of Urban and Public Affairs; and Jeyar Alsofi of Iraq, a materials science and engineering master’s student. They are among the 800 faculty and professionals worldwide who receive Fulbright grants for advanced research and university lecturing in the United States each year. Jay Horn, executive director of the Office of International Education, says the Fulbright program brings students to the University who are strong academically and who come from a wide range of countries. “That international diversity brings a richness and depth to the campus experience for all of our students,” he says.